We recommend the hotel "Rezidence Emmy****" located within walking distance of the venue. 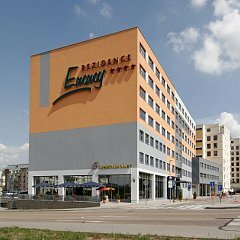 "Rezidence Emmy" is a brand new hotel located in Prague 4 close to the Krc forest park and the IKEM (Institute of Clinical and Experimental Medicine). This hotel boasts 108 comfortable guestrooms where the guests will find all the peace, space and luxurious equipment necessary for the most enjoyable stay. All the rooms at Rezidence Emmy are equipped with a series of amenities such as sat TV, direct dial phone, internet connection, mini bar and writing desk. A safe is available free of charge at the reception as well as hair dryers. Accommodation is not covered by the registration fee (we do not provide accommodation). From Vaclav Havel Airport: Take the bus No. 119 to the terminal stop - Dejvická (10 stops) and change to Metro line A (underground green line) in the direction of Depo Hostivař. At the Muzeum station change to Metro line C (underground red line) in the direction of Háje and get off at the Budějovická station. From there take the bus No. 193 (6 stops) and get off at the Institut klinické a experimentální medicíny stop (the bus stop is directly in front of the hotel). From Main Railway Station: Take Metro line C (underground red line) in the direction of Háje and get off at the Budějovická station. From there take the bus No. 193 (6 stops) and get off at the Institut klinické a experimentální medicíny stop (the bus stop is directly in front of the hotel). Holešovice Railway Station: Take Metro line C (underground red line) in the direction of Háje (Red Line C), get off at the Budějovická station. From there take the bus No. 193 (6 stops) and get off at the IKEM stop (the bus stop is directly in front of the hotel). Direction from Brno: Drive along the D1 motorway in the direction of the city centre. At the sign turn off into Jižní spojka (Southern Ring Road) (direction Plzeň/Strakonice), drive in the direction of Plzeň and after ca 1.5 km take the turn for Jesenice (Michle). Continue in the direction of Jesenice along Vídeňská Street and after ca 2 km you will see the hotel on the left. From Jižní spojka (Southern Ring Road): Drive in the direction of Plzeň/Brno/Ostatní transit and take the turn for Jesenice (Michle). Continue in the direction of Jesenice along Vídeňská Street and after ca 2 km you will see the hotel on the left. From Muzeum, Florenc: Drive in the direction of Brno. At the sign take the turn for Jesenice (Michle) and turn left into Vyskočilova Street. After ca 650 metres go right into Michelská Street (a large crossroads with traffic lights). Continue along this road until you reach Vídeňská Street and after less than 4 km you will see the hotel on the left. From Plzeň: Drive along the D5 motorway through Beroun (direction of Hradec Králové/Mladá Boleslav). Exit at Barrandov (over the Barrandov Bridge) to Jižní spojka (Southern Ring Road) in the direction of Hradec Králové. From Jižní spojka turn off at the sign for Jesenice (Michle) and at the traffic lights go left (direction Jesenice), where you will join Vídeňská Street. After less than 3 km you will see the hotel on the left.